There has been a grand resurgence in popularity and acceptance for heavy metal on the bar and club circuit and Kick Axe wants to be a very large part of it. The Vancouver-based quintet has taken some not-so-pristine steps to develop an intimidating visual image for the group, borrowing heavily from the wardrobe catalogue of Judas Priest and Iron Maiden and taking the leather and studs look to its furthest bounds of good taste. However, Kick Axe seems more than able to justify its heavy-handed stage guise with plenty of well-written original material that stresses vocal harmonising and tunefulness as much as it does brute force and bluster. Although guitarist Ray Harvey admits the band was forced to compromise its metal principles during disco's popular heyday a few years back by covering a lot of top 40 hits, Kick Axe was never prepared to totally desert hard rock. The group was originally conceived in Regina in 1976, later establishing Vancouver as its base. The present lineup consists of Harvey, co-lead and rhythm guitarist Larry Gillstrom, bassist Vic Langen, drummer Brian Gillstrom and American import singer George Criston, who left Milwaukee to join Kick Axe last December. The Kick Axe members still feel the need to include cover versions in their set, but with the commercial rebirth of heavy metal during the last four years, it's early Led Zeppelin and the latest Judas Priest stuff instead of what's popular on the airwaves. 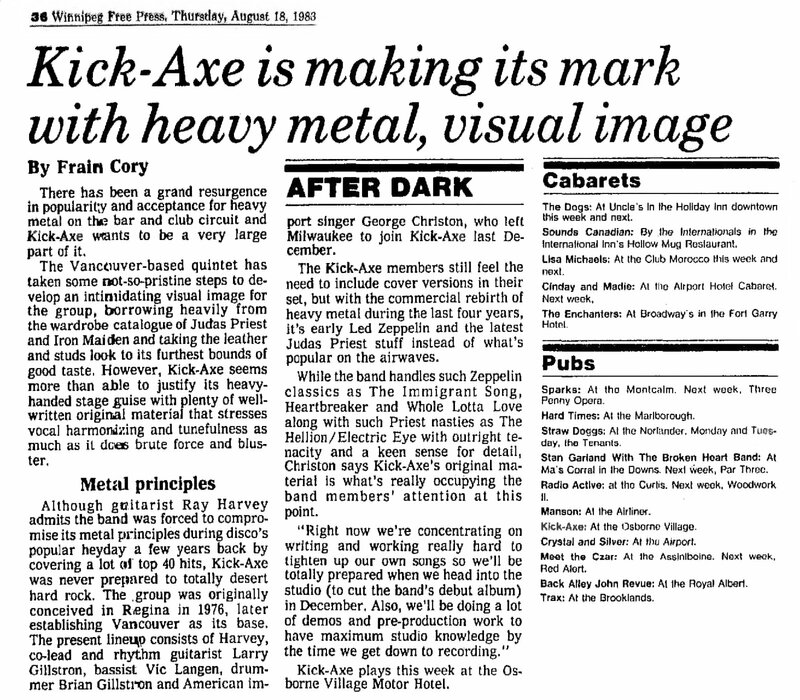 While the band handles such Zeppelin classics as The Immigrant Song, Heartbreaker and Whole Lotta Love along with such Priest nasties as The Hellion/Electric Eye with outright tenacity and a keen sense for detail, Criston says Kick Axe's original material is what's really occupying the band members' attention at this point. "Right now we're concentrating on writing and working really hard to tighten up our own songs so we'll be totally prepared when we head into the studio (to cut the band's debut album) in December. Also, we'll be doing a lot of demos and pre-production work to have maximum studio knowledge by the time we get down to recording." Kick Axe plays this week at the Osborne Village Motor Hotel.